Today we honor the fathers in our life and I am reminded to be grateful. My husband, Seth, is a fantastic dad. He loves our two children and is actively engaged in their lives. He leads this family by demonstrating godly character. He serves us selflessly, works incredibly hard at his job, is a great husband, friend and parent. It is a blessing to be his wife and to parent with someone who strives to ensure we are are consistent and on the same page. This is the first Father’s Day where my son understood we were taking a day to honor his dad. He participated in making a Father’s day gift. 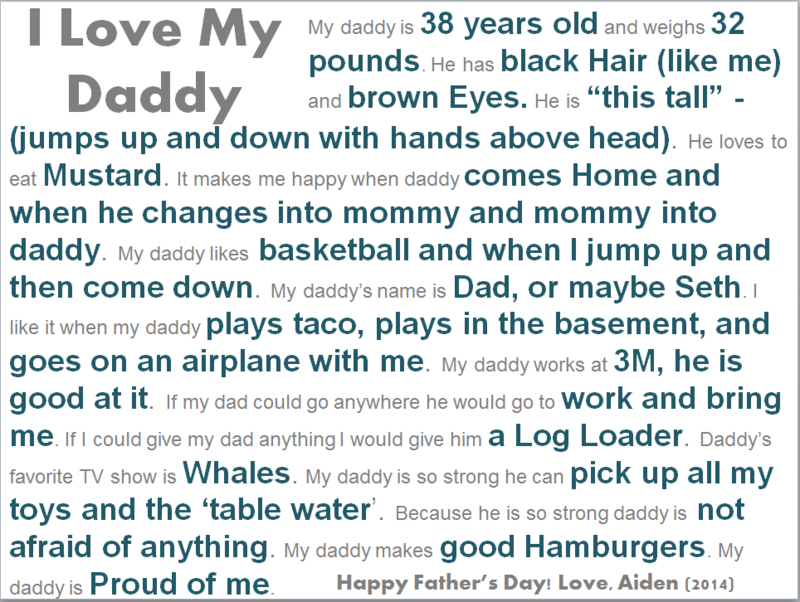 In addition to a photo desk calendar, we framed Aiden’s answers to some open ended questions about his dad. The FIRST thing I said to him was “My daddy IS…” and he answered, unprompted, “Proud of Me”. The rest of the answers are not as serious, and some are downright silly. One thing is clear: Aiden knows the heart of his dad, even at 3 years of age. His answers make my heart overflow with gratitude to the man who is the father of my children. We went to church this morning and celebrated our Father in heaven; the ultimate example. Then we went to my parents home and celebrated with my dad and my grandpa. It is very neat to celebrate with three generations of dads; a legacy of godly, dedicated, and honorable dads. We are also thankful for the fathers in our family who we did not see today (Drew, Papa John, Jesus, David and Brandon). Each of them are different, yet unified in the purpose of fatherhood. And, all excel at the job. Thank you to all Fathers today. You deserve to be honored EVERY DAY. Your dedication to your families blesses us all. You are the dads our sons will aspire to be. Below is the image of Aiden’s present to his dad. I love the 3 year old brain. Happy Father’s Day!